Field service - We provide technical field service & repair for fountains, aeration systems, and ozone systemsVegetation Management – specialized process of mechanical removal for cattail, algae, aquatic weed, trees, and bushes removed from ponds, lakes, streams, water falls, and creek beds.Biological microbe application -Spray techniques and treatments of specialized microbial species, food-grade water clarifiers, natural phosphate binders and pond dye. BCWS has expanded and developed specialized processes and equipment to further improve water quality environmentally and help restore a natural balance to the water body, without harmful chemicals, pesticide or herbicides. We provide technical field service and repair for fountains, aeration systems, and ozone systems. BCWS is factory certified to service AquaMaster fountains and aeration systems. We are the Southern California parts, field service and technical representative for E P Aeration. We service Oase, Lake, Aqua Control, and Otterbine fountain products. Specialized process of mechanical removal for cattail, algae, aquatic weed, trees, and bushes removed from ponds, lakes, streams, water falls, and creek beds. 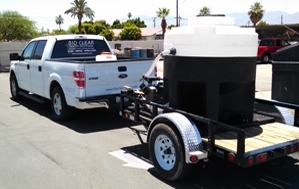 275 gallon recirculation cleaning system for algae control. 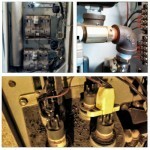 Specialized process of mechanical removal, no harmful chemicals. Custom lightweight small trucks and trailers perfect to move vegetation, debris, and mud. We tarp the pond edge and surrounding grass areas to protect against weeds and muck. All equipment is washed and cleaned onsite after service. Spray techniques and treatments of specialized microbial species, food-grade water clarifiers, natural phosphate binders and pond dye. Specialized microbial species that are cultured under EPA approved laboratory conditions. Microbial strains are uniquely capable of re-mediating hydrogen sulfide, reduce grease, filaments, and sludge production. Spray techniques and treatments of food-grade water clarifiers, natural phosphate binders and pond dye. 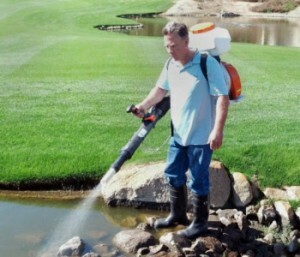 275 gal recirculation spray equipment designed for algae control for irrigation lakes, ponds and streams.